That is gorgeous Marion! I love those brushes you have used. Wow, how pretty, you've done a great job with this. It is a bit small isn't it. I had a lot of trouble finding a photo with enough pixels. It looks big enough on my screen. I love the flourishes on the side... bringing the SB'ing to the island. Well done. 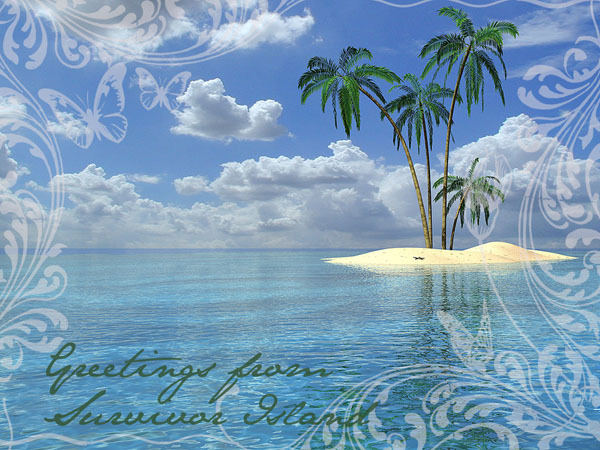 This is so pretty Marion, and we shall all be warm and cosy on the island! Love the butterflies and flourishes - great photo too! Love the brushes you've used, even if the island is a bit small. Oh love those brushes, sensational postcard.